For some time now I’ve been looking for a dustpan and broom small enough to use and store in my Caddy van home. I was thrilled to find the perfect little set with, no less, a bamboo handle. Then I saw the price – over $30. No. A little more searching came up with the same product, shipped from the US to Australia for about $10 (it was on sale). Yes. Apart from looking great, with its bamboo ring handle, it is a good size for me to keep in the van and it is made with recycled plastics. The brush just clips into the pan and stays there. Measuring 170 mm at the base, a tiny bit more in height, and only 45 mm wide, it can be hung up, or stood on its edge. It’s cute and it works well. 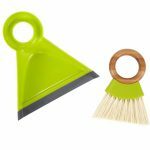 The bristles on the brush are the just the right length and thickness and the soft flexible edge on the pan helps with getting the sand/dust/dirt/whatever onto the pan. The whole unit has a quality feel to it. In summary, I love it! Mine came from iHerb. 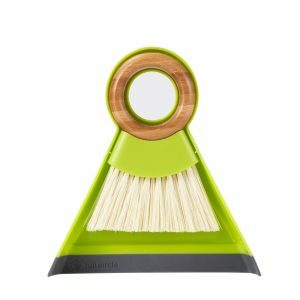 You can use this link to get $5 off your first iHerb order (search for Mini Brush & Dustpan). Or find one on Amazon or eBay . This entry was posted in All, Bamboo product reviews, Food, Home and Health and tagged bamboo, cleaning, iHerb on 16/05/2016 by Deb.